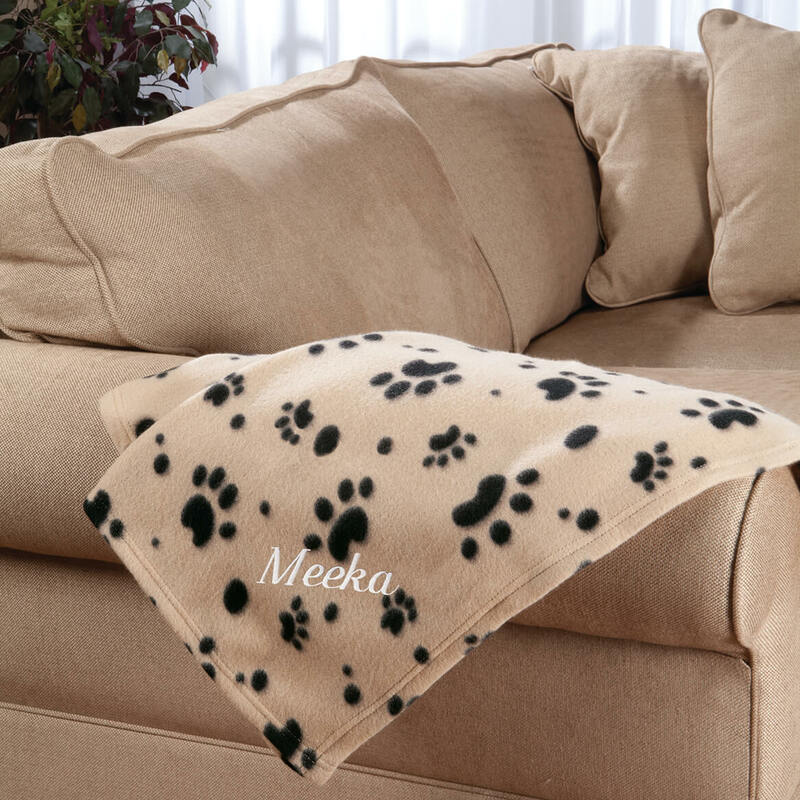 It is the perfect blanket to cover the chair that our cat lovers to sleep on. SUCCESS, no kitty hair on bedding at nighttime. I adopted a cat last year, named "Johnny." 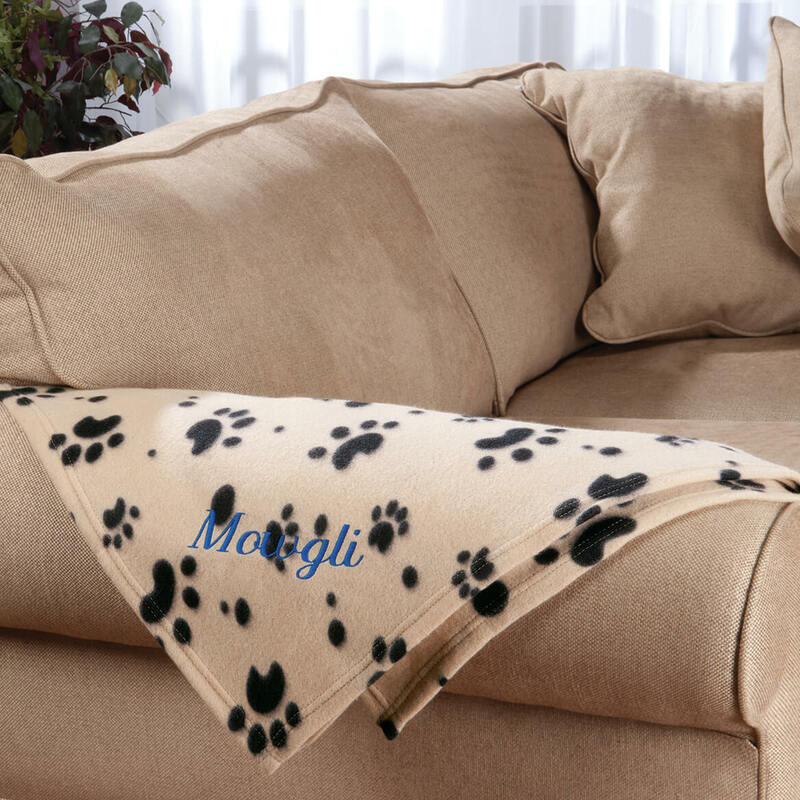 When I saw the opportunity for him to have his own soft, snuggly monogrammed fleece blanket for himself, I just had to order it! I placed it at the bottom half of my bed and he just loves it....pads it all the time! We love it! I love the blanket that I got for my mom for her dog. She is going to use it for his little house he goes into when he sleeps. She loved it and thought about using it as a throw for the couch as well. Might have to get another one for her... It's so soft and the perfect size for both. Thanks for this great item. 5 Stars! I BUY THESE EVERY CHRISTMAS FOR MY CATS! I use these at the head of my bed, during the day my cats lay on them. It avoids cat hair from getting on my bedding. I always personalize them, this Christmas one says Winkem' and the other Blinkem' I already have them at home. I interchange them each washing, none of them are ruined or faded and that's the reason I buy one for Rocky and Gracie each year. And the design is awesome also, of course!!!! I just love these blankets! I got two, one for each dog I have , One of my dogs just loves it and stays in it most of the day,! they are great! 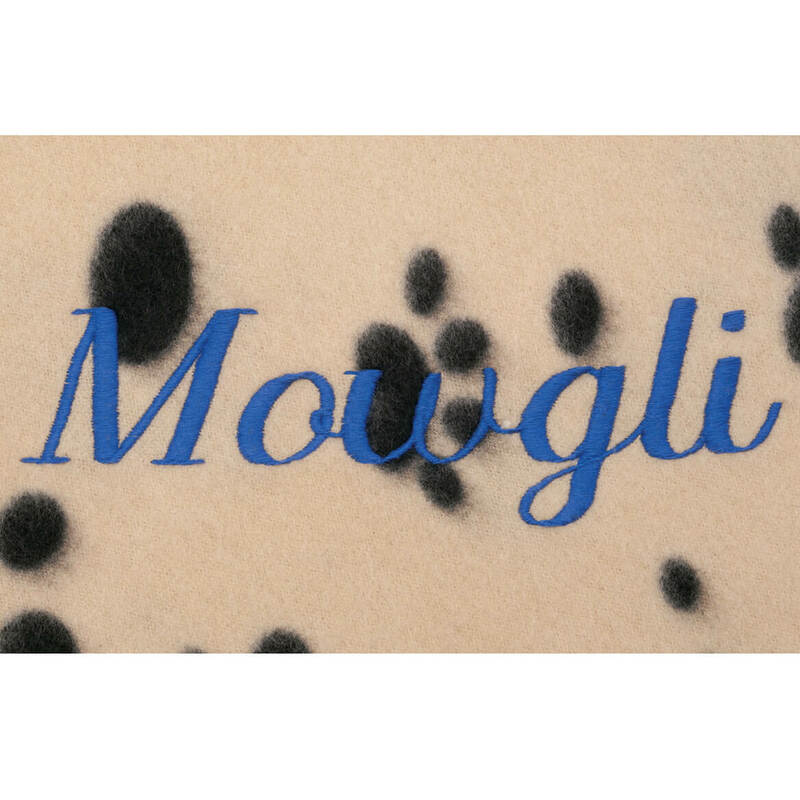 Nice personalized blanket for my dog, she loves it as it's so soft. Absolutely loved this blanket. Been trying to find a place to embroider my dogs name and finally found a great place. Very happy with the quality of this blanket. Great product, amazing price, great quality. The UPS track number never worked so I had no idea at all where the package was at after it was shipped or when it would arrive. Since it was a Christmas gift that I was counting on for a Christmas Eve dinner party I was frustrated. It did though arrive in plenty of time. The tracking system with UPS needs to be re-examined. I did call your office and the representative could not get the tracking number to work either. As this was my first time purchasing from your company this made me a bit nervous. Have purchased seven before, liked material plus quality of personal printing. They were out of the Self Warming Pet Blanket for large dogs and this was the only other blanket. New puppy in our house. 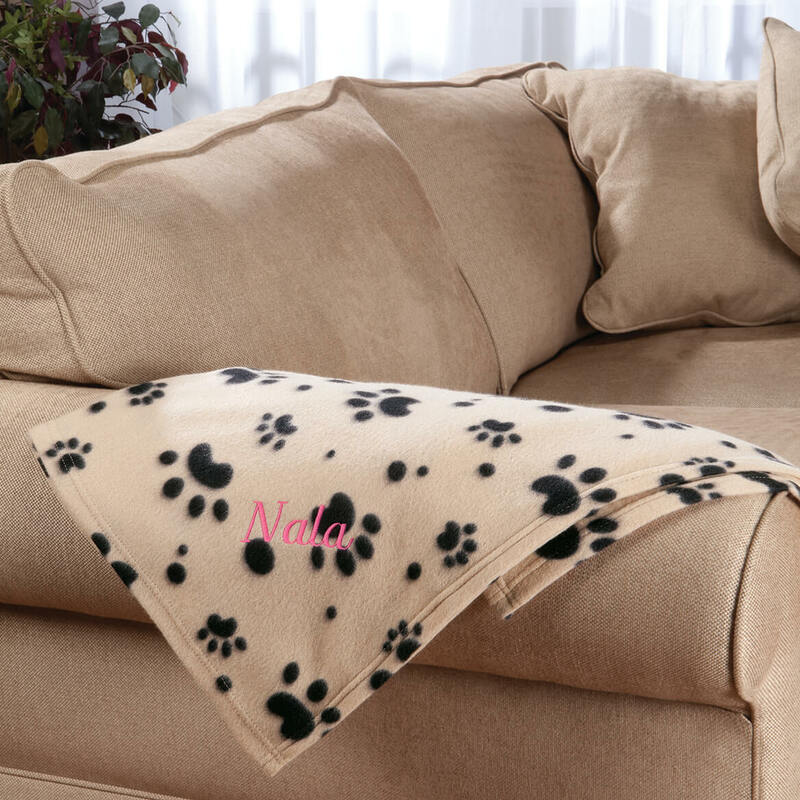 I had one of these blankets for our large Golden Retriever. I layed it on the sofa and he knew that was his spot to lay. He loved it! I took it on trips as well so he could have a little bit of "home" with him. It lasted for over 12 years, with many washings. Now that we have a new dog, he needs his special blanket. I would recommend this product. The first one I ordered for my Mom's dog was so cute. I wanted to order this for a friend's dog since the first one turned out so well. I'll use it to protect our love seat. It's cute and reviews sounded good. To keep in the car for the dog in the winter. I liked the way the blanket looked and I need something to toss on my furniture for my dog to sleep on and feel cozy. The reviews were also positive. Christmas presents for my poodles. My dog likes soft blankets. My dogs love these blankets. In winter my dog drags this blanket from the living room into my bedroom, tosses it on top of my bed, makes a ball out of the blanket and then lays down right in the middle of it and sleeps just like a baby every night. My new rescue puppy loves to burrow in soft blankets! Our pet loves this blanket! As Stevie has two beds, we made this second purchase. Have 4 already, just LOVE them and so do my kittens! Looks like good quality, the edges are hemmed! great value and my dog will love it! Needed something inexpensive to help protect chair. Love that I can put my pets name on it. Dogs are family too. Nice present. For my dog. He likes to be covered up!! It looks like it will be cute and comfy for my puppy! 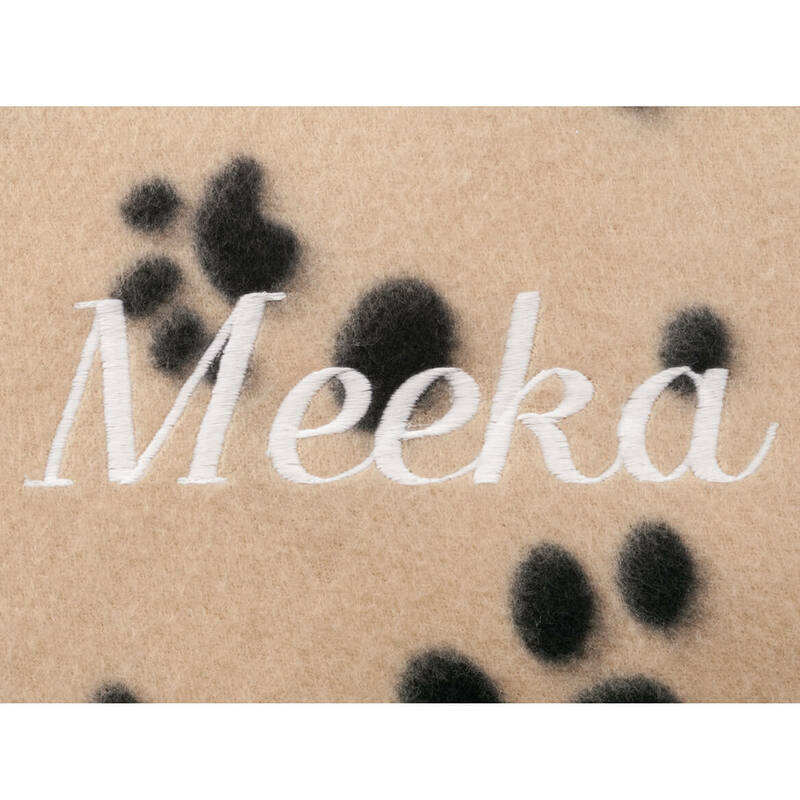 My friend loves her puppy and I know she will love this little blanket. Our new puppy needs his own blanket. I have 3 new puppies. This item is perfect for them! To order, where to put name to go on blanket? BEST ANSWER: Thank you for your question. Once the color of the personalization is selected, click personalize and it will ask for the personalization. We hope this information will be of help to you. Is this blanket available? This is the first of Oct.
BEST ANSWER: Thank you for your question. Unfortunately, at this time we do not have an expected in stock date for the blanket. We hope this information will be of help to you. BEST ANSWER: Thank you for your question. 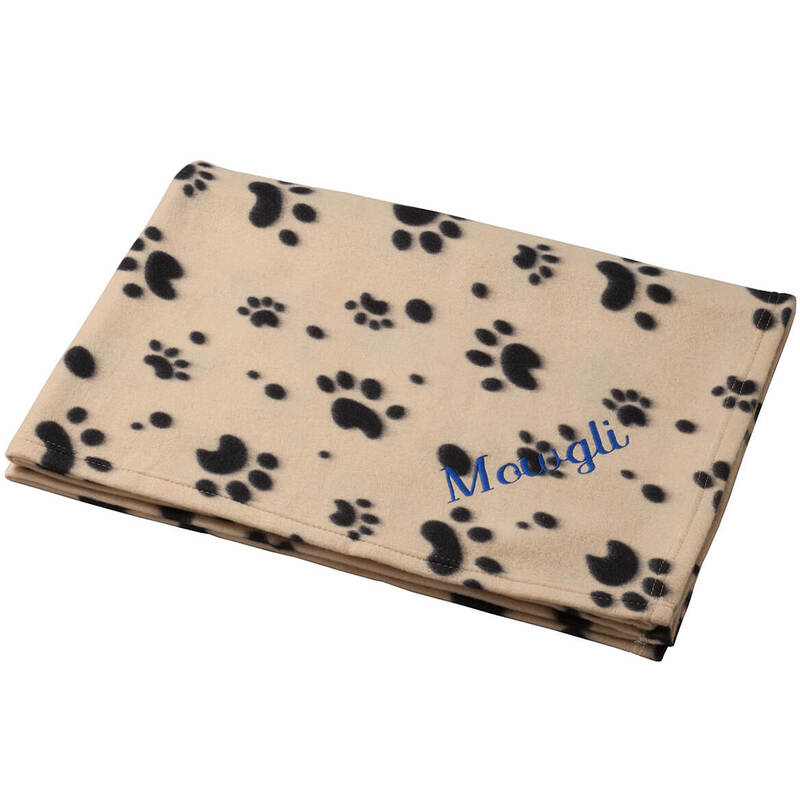 We are expecting the paw print pet blanket back in stock towards the middle of September. We hope this information will be of help to you.